I can now proudly display these buttons on little old SNM......if only I can figure out how to get them to show up. Hmmm. 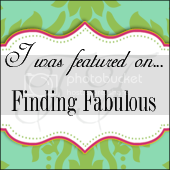 See, the very crafty Jane at Finding Fabulous featured the DIY Art Wall on Frugalicious Friday Favorites on Finding Fabulous (I love alliteration). THANKS, JANE!! I am honored!